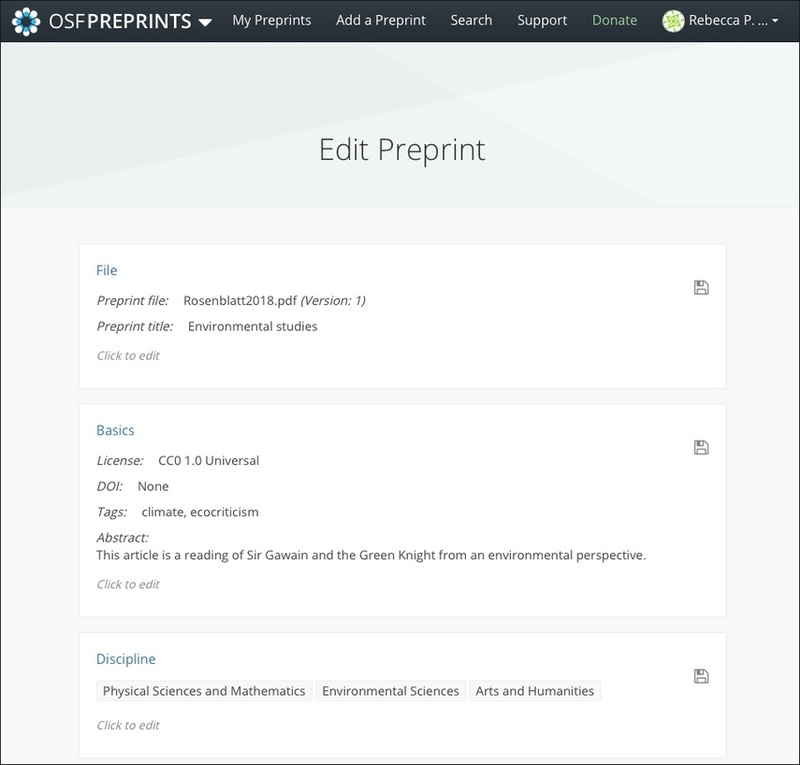 You can edit your preprint to update its title, version, subject, license, abstract, DOI, and authors. You must have admin access in order to edit a preprint. First, open your preprint page, then click the green Edit preprint button in the top right. The "Edit Preprint" page will appear. New versions must have the same filename and be the same file type as the original. All versions are saved. See Download Previous Versions of Preprints for more detail. 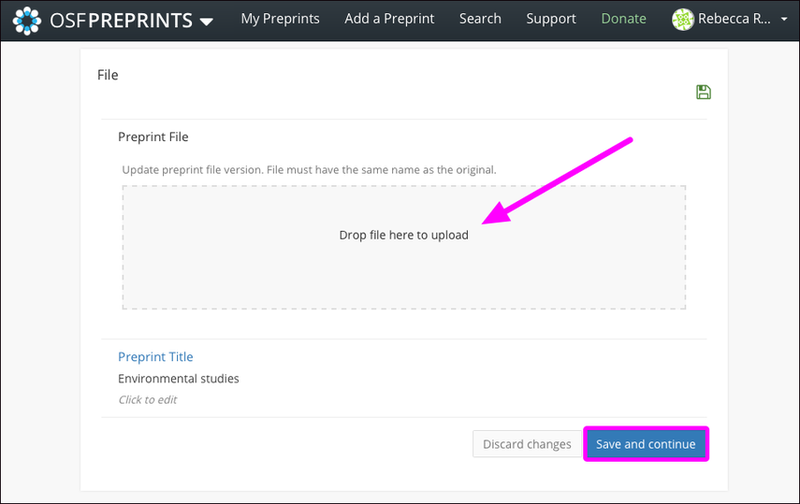 Click the File section to edit the preprint file. Then, click the Preprint File link to upload a new version. Drag and drop the new version into the upload box, then click Save and continue. The new version of your preprint will be labeled according to the version number. 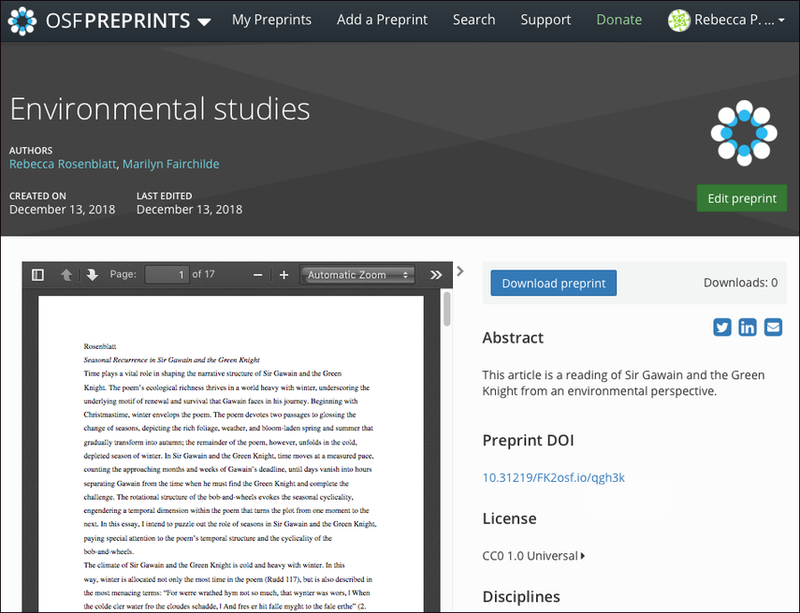 Then, click the Preprint Title link to edit your preprint title. 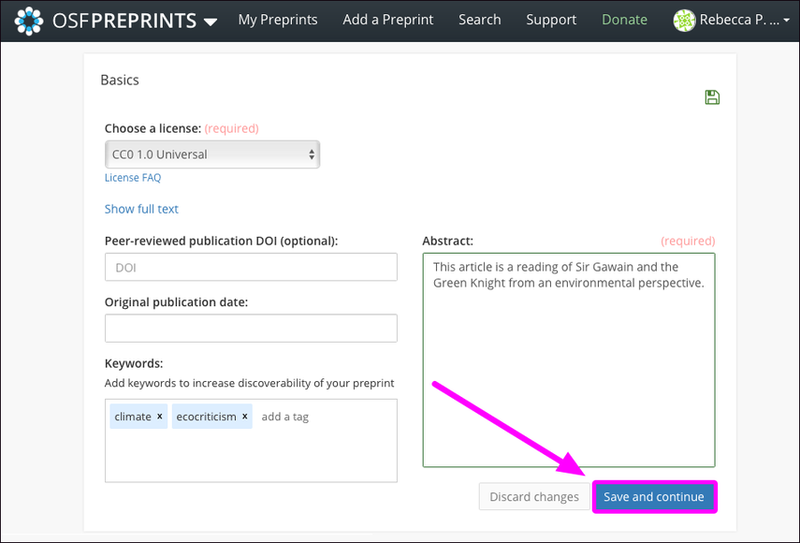 Edit the title of your preprint in the "Title" field, then click Save and continue. Update the license, DOI, publication date, tags, and abstract in the respective fields. To add a discipline, select one from the list. To remove a discipline, click the white X. You can add more co-authors by typing their names into the search box. If your co-authors have accounts on the OSF, their names will appear below the "Results" section. If they don’t have an account on the OSF, you can add them as an unregistered contributor by clicking the blue Add author by email address button. Click the green Add button to add additional co-authors. You can reorder authors by clicking the icon with 3 bars to the left of the author's name, and then dragging and dropping the names into the correct order. You can modify authors' permissions and indicate whether or not they should appear in citations. You can also remove authors by clicking the red X to the right of the author. If you're adding supplemental matierals, jump ahead to the Connect an existing OSF project or Create a new OSF project sections. 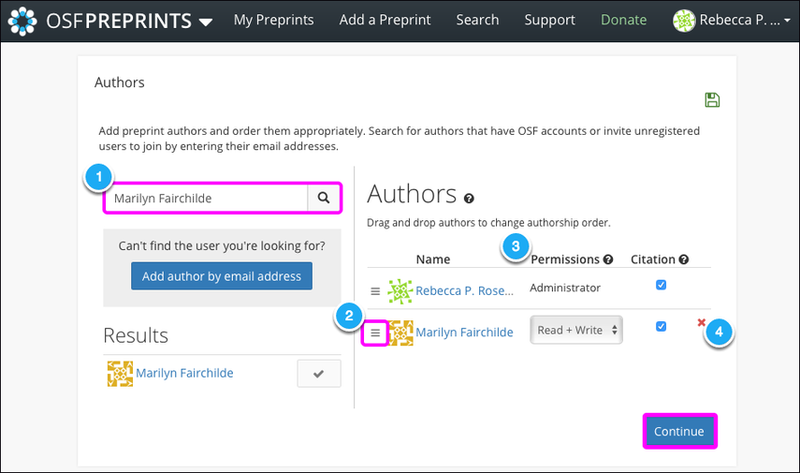 Add supplemental materials to your preprint by storing them in an OSF project that will be connected to your preprint. Choose this option if your supplemental materials are stored in a project different from the one you originally connected. Click Change the connected project. Then choose to either connect an existing OSF project or create a new OSF project. Select a project from the drop-down menu. Do you have supplemental files that you want to remove from your preprint? 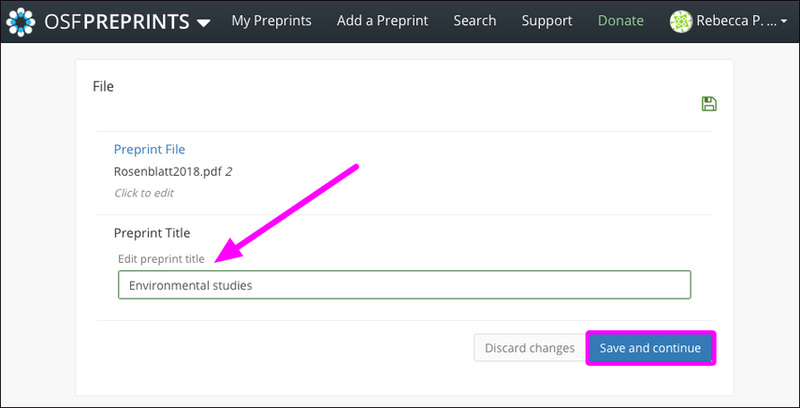 Select this option to disconnect the project that is storing the files from your preprint. The project and supplemental materials will be disconnected from you preprint. When you're finished editing your preprint, click the Return to preprint button at the bottom of the page. Your preprint will be updated.